The virion RNA is infectious and serves as both the genome and viral messenger RNA. 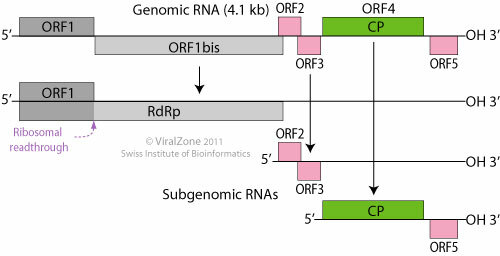 Two 5'-proximal ORFs are directly translated to produce the viral constituents of the replicase complex. RdRp is translated through suppression of termination at the end of ORF1. 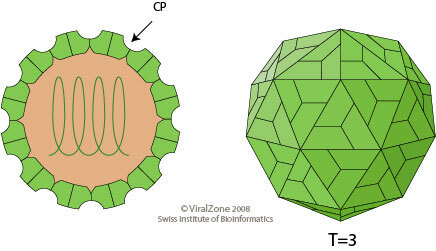 The downstream genes encoding the movement and capsid proteins are translated from subgenomic RNAs. ORF2 and ORF3 are necessary for cell-to-cell movement, while the capsid protein p29 is needed for particle assembly and systemic movement.